Stephen King, Rock Star Writer | Write to the Point! 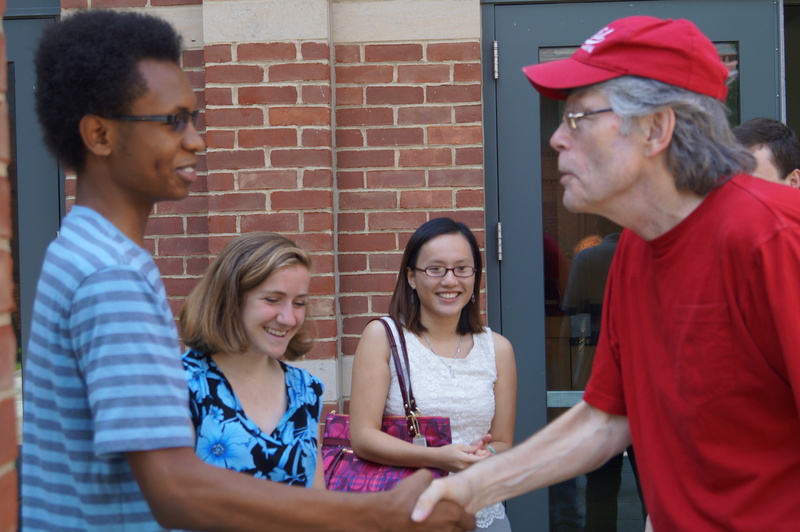 Writing Apprentice Rae Martin shakes hands with author Stephen King at the Mark Twain House & Museum while Apprentices Molly Miller and June Tran look on. The thoroughly publicized Stephen King – Colin McEnroe interview at the Bushnell Center for the Performing Arts on Thursday succeeded in packing the house and raising lots of money for the Mark Twain House & Museum. Everyone shuffled to their seats; some dressed to the nines, others, not quite. The place itself was well designed, as many old buildings tend to be. Priceless architecture, beautiful ceilings, 1930s styled seating, and an atmosphere completed by a prestigious place across the plaza from the state Capitol. Following McEnroe came the big man himself, Stephen King. They both sat and began to talk. And talk. And talk. His personality, a bit like that of a rock star, and the mythos of King and his works kept the crowd enthralled. The most intriguing thing wasn’t so much what King said – though he was often funny – was just how fretfully normal he seemed. Put his fame aside and you get a roughly average Joe. Unfortunately, this seems to be the reality of most “celebrities,” and discovering this hard truth nearly detracted from the experience. Nearly, but not quite, as a story still came from the evening and from a later, personal encounter with him. “Personal encounter” is actually a major over-exageration. As King exited his Friday morning tour of the Twain House, my workshop group and I stood in his way, fawning over his performance from the night. If we hadn’t, he would have been able to circumvent us entirely. Truth be told, I was a bit anxious about pestering the man for an autograph – keep in mind that was my main goal – but he seemed to find the group’s attention cute enough to come over, shake our hands, say hi and take a few pictures. He must be very used to these things by now, but he was very courteous about all of it. It was a simple sentence to represent the underwhelming nature of it all. Of course the kids were thrilled, more for his celebrity than anything else in that exchange. As much as I would hope to be successful in my craft, the type of instant recognition King gets is detrimental to the nature of most writers. We are to act as observers and highlighters of the world around us. In any case, I wish King the best of luck in the future. He’s reached a cultural level I probably never will. Thanks For A Great Experience!